Longboat’s hotels, resorts and beach houses maintain their own beaches. But not all Longboat’s beach areas are private, visitors are welcome, too. Heading north, one of the most popular public spots is Whitney Beach. 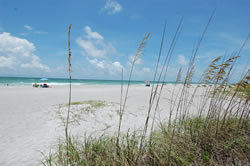 Fringed with sea oats, its open shoreline and uninterrupted view of the Gulf invite beach-goers to take a long walk. After a day of sunbathing and swimming at Whitney Beach, be sure to take in a sunset. The view is awesome here!